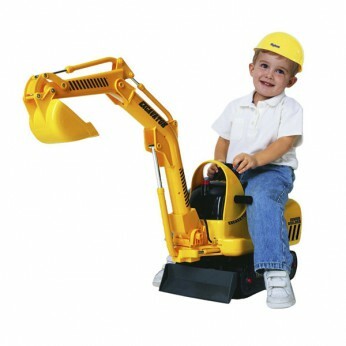 This sit-on excavator features two different engine sounds and comes with a play hard hat. Push and pull the control sticks to operate the bucket as you wish. Batteries required. Dimensions: 169L x 45.1W x 28H cm. Recommended age 3 years +…. This toy costs approximately £44.99 (for the latest and best prices make sure you check our retailer list for the Micro Excavator above). In our review of Micro Excavator we classed it as being suitable for ages 3 years, 4 years, 5 years but recommend you check the manufacturer specific advice before purchasing.